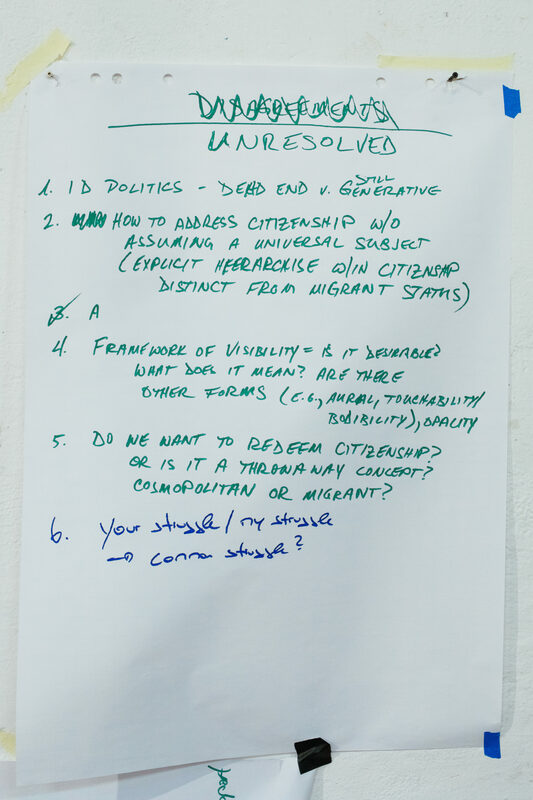 We present here a compilation of unfinished and open notes, images and proposals on the subject of “Invisible Walls”, this material was created and compiled during the Friendly Fire workshop and conference hosted by the Berliner Gazette as a response to the question Are Asylum Seekers Political Actors?. We began by questioning this opening question. Who are asylum seekers? Who are political actors? What are key terms to unpack? “Asylum seekers” itself is a state-based definition that creates categories, division and hierarchies not only between citizens and non-citizens but also amongst migrants and refugees. For example, categories of asylum seekers, economic migrants, immigrants, undocumented people, refugee, and climate refugees are all distinct legal categories. Asylum seeking has become a business with an entire industry created around migration and migrants have to struggle to become citizens. The marginalization of non-citizens fuels the capitalist economy, especially the shadow economy that exploits cheap migrant and refugee labour. Asylum process is underwritten by a number of barriers, invisible walls, and racialized discourse – for example white middle class mobility is framed as global citizenship and cosmopolitan and never criminalized. “Citizenship” is granted by the state and relies on permission from the state. There is also the issue that positioning non-citizen versus citizen assumes that citizenship is a full project to be achieved or one that has never been achieved. We recognize that there have always been hierarchies of citizenship across race, gender, class, ability etc. and that the war on the poor (furthered through austerity) has eroded state’s institutions and created a climate of division and competition driving right-wing populism. Furthermore, even as people gain citizenship, the transition to citizenship has numerous impacts including continued racism and oppression, discrimination based on last name and accent, and not being allowed to vote. This is what we can call “constantly migrating”; that is, regardless of gaining citizenship, one doesn’t feel a sense of belonging and faces many invisible walls. Finally, what do people gain through citizenship (right to vote, not facing deportation) and what are people forced to give up in order to attain citizenship (subject of rights, integration as indoctrination, and becoming an independent political actor)? We also note that claiming citizenship can be an insurgent political act, for example indigenous passports being issued by Indigenous nations in North American and Australia. Finally, the conversation around migrant and refugee ‘crisis’ focuses on the South-to-North (e.g., the African continent to the European or North American continents) migration, and ignores South-to-South migration. At least 90 percent of displaced peoples end up in neighbouring countries and/or within the Global South. The fixation on the North alone with (false) border panics reveals racism and imperialism. And the reasons that people are here is because the North/West has destroyed the lands and economies of the South. Contemporary citizenship only exists due to historic and ongoing colonization, mining, weapons trade, and extraction of labour and land. 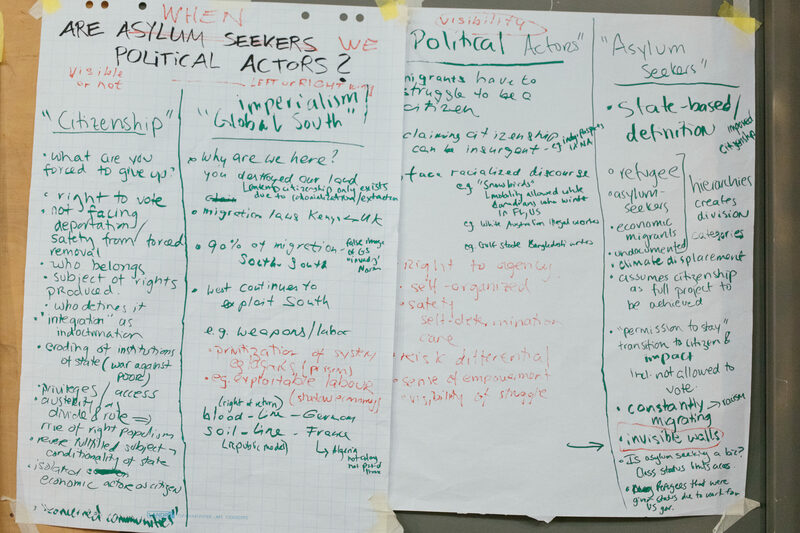 Despite the limitations of the question, we agreed that asylum seekers are political actors with the right to agency, are often self-organized to create and affirm safety, self-determination, empowerment and care networks. 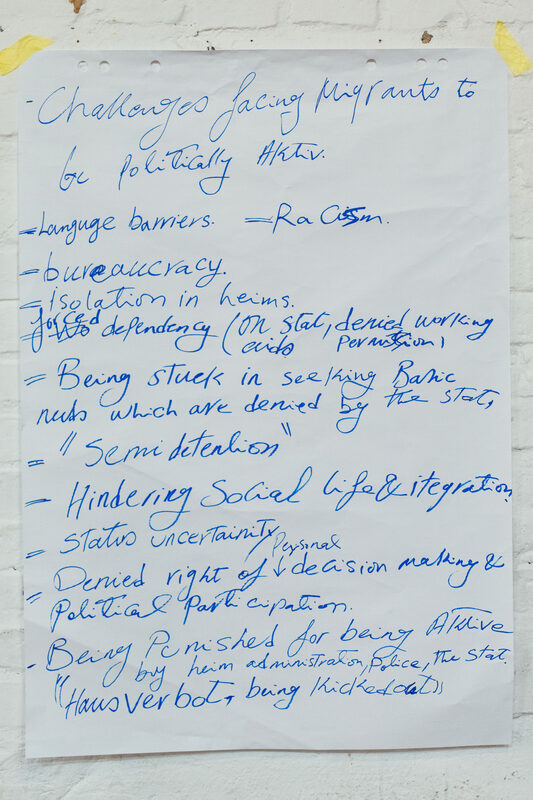 Implied in the vocabulary of political actors is the risk differential – that different people can take different risks and there are visible/invisible (to state and society) forms of struggle. When we assume that every person is potentially a poltical actor, then we could say that an invisible wall is something that is obstructing certain persons from realising her or his potential to be a political actor. Coming to Berlin, we hit so many invisible walls. Language barriers, then sexism, then racism, all which lives inside the bureaucracy. If we have children to take care of there is not the support to do that properly here while living in homes that feel like detention centres, and we cannot work or go to school. If you put together all the walls we must go through on the way to finding a sense of belonging here, it makes an architecture. Not like a building, but like a maze. The secret password for moving through these walls is always “money”, and not “human rights”. This is the bad news: if we make it to the centre of the maze, a potential safe zone at the successful-paradise-centre of society, that’s where we find a golden fence which protects a golden cage. That is where you are kept once again. It’s not paradise in there, it is just more invisible walls. 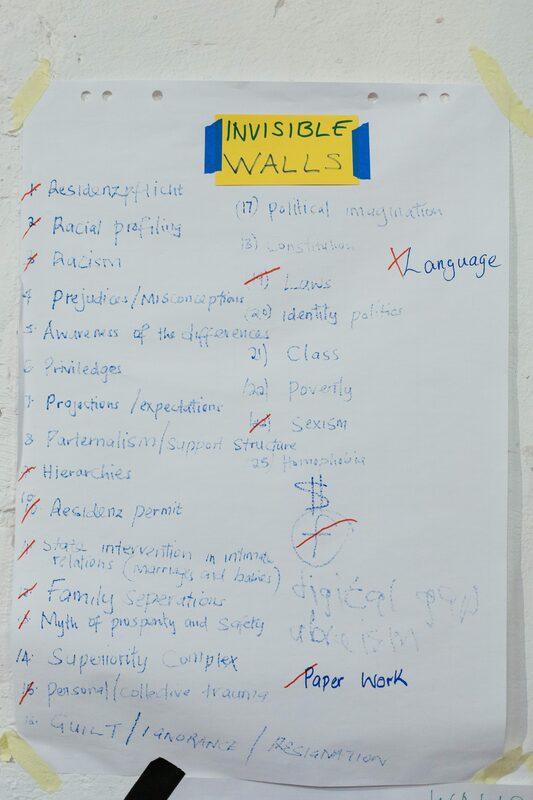 In our group, we discussed the experience of migrants*, and of so-called citizens as being defined by our common experience of invisible walls. We imagine that on the other side is a different kind of survival, but we aren’t sure. These walls are the kind that you may not know about until you feel your body up against it. Some people may live a long time before realizing the walls are there. (The definitions we are using, of invisible walls, are informed by the work of Sara Ahmed, and her work with that metaphor when describing the struggle of a diversity worker to work within and change institutional structures. ) Where did these walls come from? It feels as if the brick walls are the solidifications of an imperialist, colonialist history— the “building materials of power” (Ahmed). The common experience we share of being shoved against an invisible wall has taught us that the hardest things are those things that can’t be touched. “What do we mean when we use the word invisible wall? A wall that you do not see, that you cannot see or that you do not want to see. It depends on your perspective, on your position if you see it, or feel it Sense it. It is then a matter of sensitivity. Then to make it political, it also depends on you political position, your interest, on what side of this wall you are. The will to sense the things that block equality, cooperation, solidarity is in itself political and becomes agency when you try to deal with it . On the other hand, the man or woman who builds, is maybe even part of the wall, can see it, but for him or her the wall is not an obstacle, but a protection of this position, e.g. her or his job in the state. Something to hide behind. That is why it s/he cannot sense easily what this wall means for an immigrant. What do we need to sense the invisible wall? To look at it from another perspective. If Sabrina went with an asylum seeker to a state office to get unemployment money, she is able to sense how hight the wall is. The paperwork, the language, the way the public servant looks at you, the presence of an interpreter ar all bricks of this wall. I personally like to believe that we are always able to break down walls, even the invisible ones. We can start this difficult process by meeting and teaming up with another person, in a different position. To look at things and situations fr m another’s perspective. And then try to communicate” . 3. Invisible state interference in intimate relationships ie the decision to marry or have children informed by lack of papers. 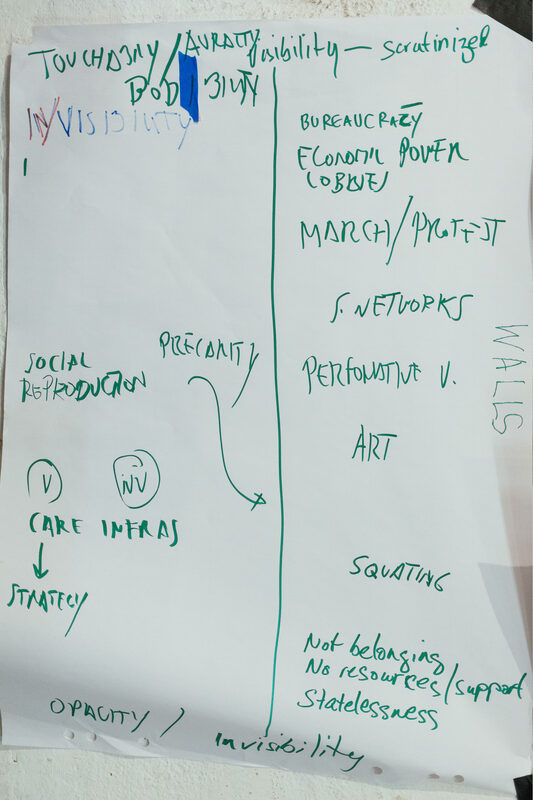 We begun by sketching the issue as a continuum, arranging visibility and invisibility as two poles on an axes on to which position different aspects of the migrant, asylum seekers and refugees experiences. This two poles were not meant to set out a hierarchy – in fact, the opposite was at stake, that is, to show how both visibility and invisibility can function as protection or against the migrant subject. Visibility regimes can be in the eyes of the state, and equal control and surveillance as well as access to more rights. 1. Bureaucracy: how this makes people visible and legible in specific ways, which are problematic as hard to negotiate. 2. Economic power: this allows specific subjects to become visible in desirable ways, controlling the storytelling and impacting legislation. 3. Marches/protests: these are techniques for making issues visible in public space and discourse. However, not everyone can afford to participate with their bodies in these situations. 4. Performative visibility: visibility or invisibility as regimes of performing the self for others and for power structures. What is that is not get shown or cannot be shown in various circumstances? 5. Art: art practices can be a resource for making issues and experiences visible in ways that are not the ones used in dominant media discourse. 6. 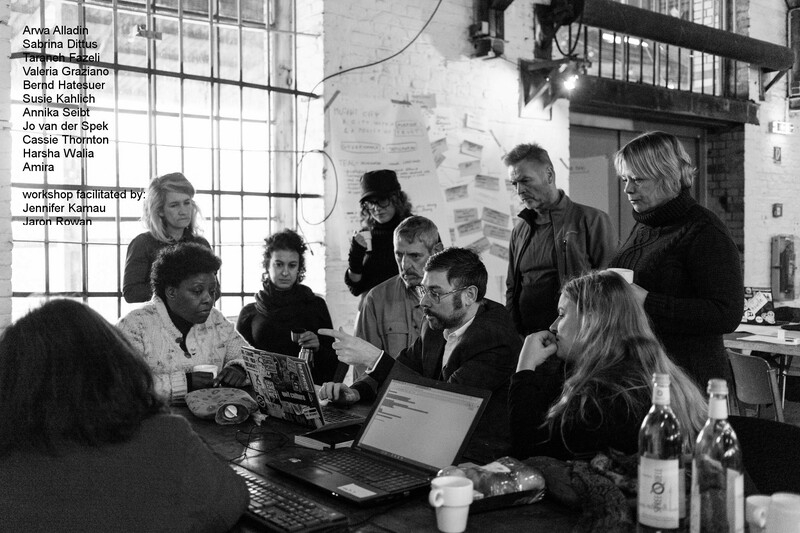 Squatting: this is a tactic that can benefit both from being extremely invisible or seeking extreme visibility for political impact. 7. Not belonging/ not having resources or support/ statelessness: these conditions are often invisibly at work and also produce and are the product of regimes of invisibilization. 8. Invisible support structures: activated by migrants and allies beyond and against the demands places on the state. They are vital and yet problematically invisible as they replace resources that should be made available. 9. Precarity/ social reproduction/ care infrastructure: this was mapped as something that runs through the entire spectrum. Much social reproduction is undertaking in the private sphere of domesticity, and it is also pushed there as a way to make in invisible, ‘natural’ and cheap. 10. Opacity: this was discussed as an alternative strategy (following Eduard Glissant proposal for a ‘right to opacity’) – the right not to be made transparent – against the assumptions that one has to be full proposal for a ‘right to opacity’) – the right not to be made transparent – against the assumptions that one has to be full legible to be eligible. While language barriers seem obvious when speaking about invisible walls, the inability to read, write or express yourself in the language of a host country or a common language understood by all in daily life can serve as the mortar in that wall: navigation becomes almost impossible when street signs, subway signs, even enter and exit signs to buildings make no sense. If you find your way around the city, you are vulnerable to racism and bigotry. If you’re with your children, you can’t de-escalate confrontations to keep you and your family safe, you can’t even speak up against verbal attacks — you can’t defend your own humanity. Social activities, such as sports or arts or music, as an avenue of integration are barred when you don’t even know how to ask where to find them, and you are excluded from conversation if you somehow manage to find them anyway. Even basic survival needs are jeopardized: you can’t even read the ingredients on packaged foods, so you have no idea if a food complies with religious or dietary needs. “You have no idea if something is Halal, or if it has an ingredient your child is severely allergic to,” and you don’t know how to call an ambulance or the police. In our Heim, the bathroom and kitchen was shared between people from Christian countries and Arabic countries, who each have different ways of caring for their assets [e.g., forms of hygiene]. In my home country, we invited Muslims in our village over for Christmas dinner, and they invited us over for their holiday meals, which I loved because their food is so delicious. But in the Heim, after sharing the bathroom, I found myself not wanting to use the same kitchen as the Muslim people in the Heim, and then I had to ask myself: am I having a problem with a Muslim? when I never did before. 1. Did I do the right thing? 3. Do we want to redeem citizenship or is a throw-away concept? 4. Are refugee-migrant struggles only ‘your’ struggle or is it also ‘my’ struggle? How do we connect across different struggles through common purpose. Guests: Arwa Alladin, Sabrina Dittus, Taraneh Fazeli, Valeria Graziano, Bernd Hatesuer, Susie Kahlich, Annika Seibt, Jo van der Spek, Cassie Thornton, Harsha Walia. Facilitators: Jennifer Kamau & Jaron Rowan.